Castiglione della Pescaia is one of the most popular and well-equipped bathing centres in the Maremma, one of the most efficient and attractive destinations in Tuscany. The old center is perched on an outcropping of Monte Petriccio and, with its embattled towers, overlooks one of the loveliest landscapes in the Maremma. Its massive offensive walls with their 11 towers, 3 gates and the 15th century castle have kept their medieval fascination, as have the narrow stone streets, ancient portals and ever present niches and arcades. The following frazioni are part of the comune Castiglione della Pescaia: Ampio, Buriano, Macchiascandona, Pian d'Alma, Pian di Rocca, Ponti di Badia, Punta Ala, Riva del Sole, Roccamare, Rocchette, Tirliandn Vetulonia. The ancient lake Prile once stretched to the east of the town, an Etruscan possession before it became the Roman Portus Traianus. With the passage of time, the lake began to dry up and was replaced by a vast marshland, subsequently reclaimed as part of the work promoted by the Grand duke Leopold. 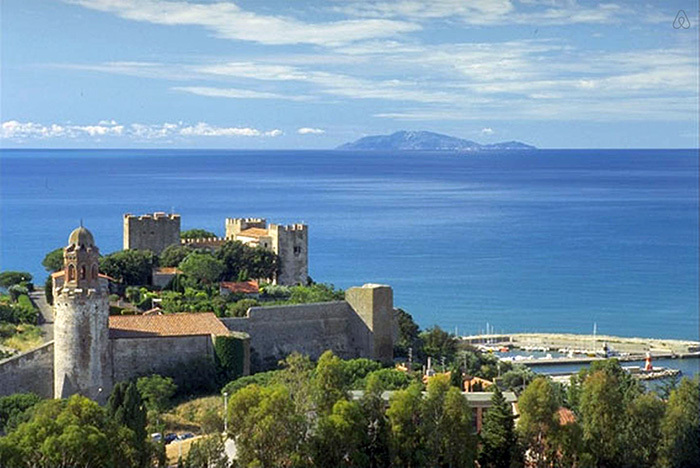 There are many fascinating spots around Castiglione della Pescaia that deserve a visit. Vetulonia is one of the most important Etruscan cities where it is possible to visit a necropolis and an archaeological museum. The town of Tirli, known for its simple and genuine cooking, makes it easy to see what life in the Maremma of old was like. 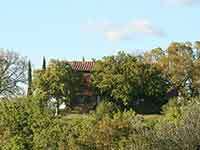 The ancient town of Buriano offers a medieval castle and a spectacular view over the Maremma. And finally, about 15 km from Castiglione della Pescaia, is Punta Ala. This tourist resort is famous for well appointed bathing establishments, excellent hotels and, most especially, for its modern and fully equipped port, considered one of the best in the Mediterranean. Other attractions are the castle, the Pieve di San Giovanni Battista and the itinerary towards the Eremo di Sant'Anna. The Nature Reserve of Diaccia Botrona extends for more than 1000 hectares of territory and is considered the most important wetland of Italy (since 1991 recognised also at an international level). It was set up in 1996 in the area that once was home to the old Lake Prile of up to 50 km squared, reclaimed in the nineteenth century. Currently the marshland takes up about 700 hectares at the back of the pinewood in Castiglione della Pescaia, extending along the plain that connects the seaside resort with Grosseto. The visitors' center of the Multimedia Museum was created in the beautiful Casa Rossa Ximenes designed in 1765 by the environmentalist Leonardo Ximenes, and commissioned by the Grand Duke of Tuscany, Pietro Leopoldo of Lorena. Itinerary to discover the remains of the Ximenes Aqueduct, the old mill and the Hermitage of Malavalle. 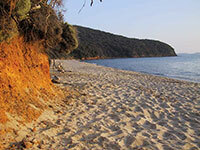 The Maremma coast, with its constant thermal wind, is ideal for windsurfing and kitesurfing. Near Castiglione della Pescaia, in the Pinetina Sud area, next to Camping Etruria is the Professional Kite School Pks Beach. More to the south, just before Marina di Grosseto is a kitesurfing, windsurfing and SUP school, Kite Beach Fiumara. TUSCANY: WHERE TO SWIM, SURF, HIKE AND EAT in Castiglione della Pescaia | Usefull information about this seaside village, what books to read or movies to see, where to have dinner or lunch and where to find the best gelato in town. Exdellent blog by Katja Meier, author of Across the Big Blue Sea, her memoir about a Tuscan refugee home. Questo articolo è basato parzialmente sugli 'articoli Castiglione della Pescaia e Track cycling Marina di Grosseto-Castiglione della Pescaia dell' enciclopedia Wikipedia ed è rilasciato sotto i termini della GNU Free Documentation License.